One problem with binary numbers is that while computers love them, they are unintuitive for humans, who are used to decimal numbers. One reason for this is that they quickly get very, very long and cumbersome to deal with. For example, 1,000,000 in decimal is 11110100001001000000 in binary. To make binary numbers easier to work with, two different shorthand notations have been defined. In both of these, instead of working with each bit individually, they are collected into subgroups, each of which is assigned a single digit in an alternative numbering system. Let's take the binary number 11110100, which is 244 in decimal. Now, instead of looking at each bit individually, let's chop them into groups of three, starting from the right. So, 11110100 becomes (11)(110)(100). Now, each of those groups has three bits, so each can have 23 values: from 0 to 7. In this case, (11)(110)(100) = (3)(6)(4), or 364 in the octal or base-8 numbering system (see Figure 9). Just as with binary, octal numbers are the same as decimal numbers, except they are base 8 instead of base 10. So, 364 in octal is just 3 times 64 plus 6 times 8 plus 4, or 244. The advantage that octal has over binary is obvious: it's a lot less cumbersome to deal with larger numbers. 1,000,000 in decimal is 3641100 in octal. 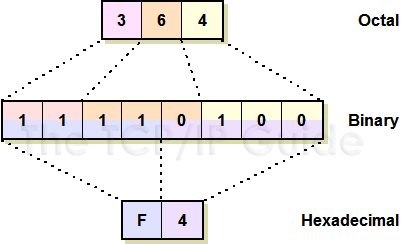 A binary number can be represented in octal form by grouping its bits into sets of three, or in hexadecimal by using sets of four bits. These base-8 and base-16 numbers have the advantage of being far shorter than binary numbers, and hence much easier to work with.